Some of my most cherished memories from childhood are from the years I lived on my grandparent’s 160 acre farm in the Willamette Valley in Oregon. My grandfather would plow his fields with a team of mules and I would plod along behind busting up dirt clods with my bare feet. We had chickens that ran free and while we plowed they would follow along behind us devouring earthworms the plow dug up. I now live in the ‘burbs with chickens in the backyard and a garden that’s tilled by shovel. My chickens love to accompany me while I dig, all the while eating worms my shovel turns up. My flock usually averages around twenty to twenty-five chickens, and each demand their fair share of the bounty. However there are never enough worms to go around so a few years ago I hit upon the idea to raise worms to feed my chickens. After all, I love my birds and want to keep them happy and healthy. I’ve found raising worms to be quite easy and very rewarding. The advantages of raising worms don’t end with just feeding your chickens. Besides helping to cut down on your feed costs, worms are incredibly proficient at reducing your kitchen waste to compost. The compost, called worm castings or vermicompost, is an excellent source of fertilizer for the garden or potted plants. It is rich in humic acids that help condition the soil and contains up to five times more nitrogen, seven times more phosphorus and eleven times more potassium than ordinary soil, nutrients essential for healthy plant growth. 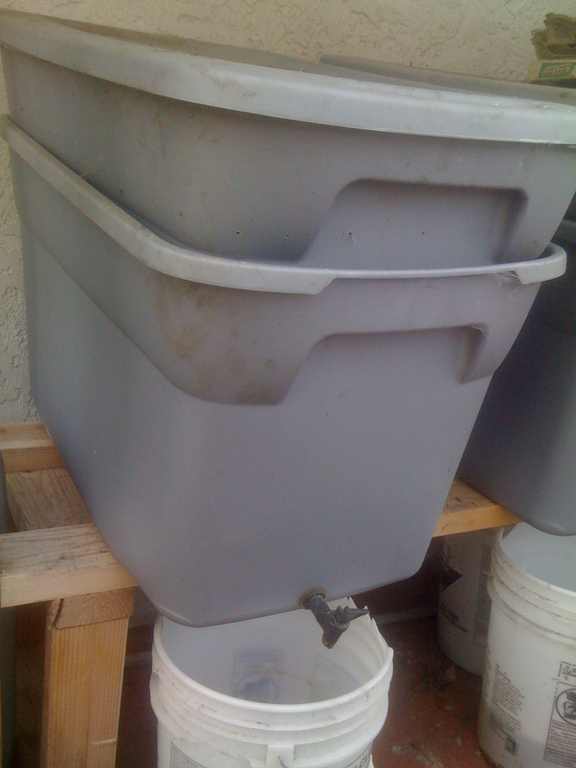 All that is needed to raise worms is a container to hold your worms, food scraps and some kind of bedding. The bedding can be shredded newspaper, composted manure, fallen leaves, or just about any organic, compostable material. Avoid using highly acidic leaves such as Oak as the worms don’t like them much. Also, I don’t like to use white paper because of the bleach used in its production, or colored papers because the inks and dyes may harm the worms. Double bin system. Note added drainage spigot. I use large plastic bins with a lid for the container. Drill some 1/8” to 1/4” holes in the bottom for drainage and several holes in the sides and top for ventilation. Choose a size according to how much waste you have. It is very easy to add bins in the future if you find that it’s necessary. You can catch the drainage water by placing the worm bin inside a second bin which has no holes in it. The water that collects should be disposed of periodically. I install spigots in mine to facilitate draining. Add worms and food scraps and let them go to work. 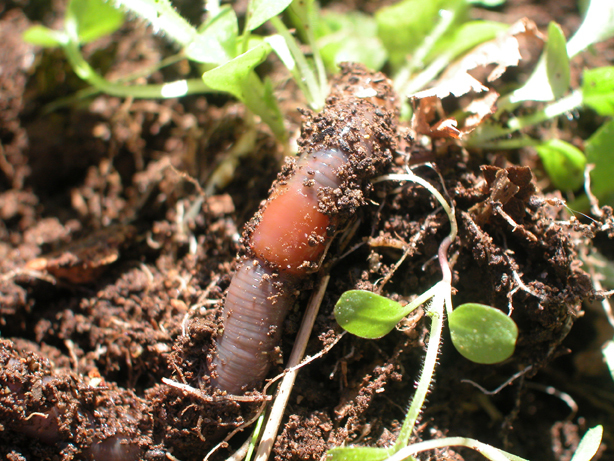 Red wigglers, eisenia fetida, are best for composting. You can usually find red wigglers at a local nursery or they can be bought online. The earthworms you find on your lawn after a rain are a different type and aren’t the best worms for composting. Next time I’ll talk a little about managing your worms, what you should and should not feed them and how and when to feed them to your chickens. I am very interested in starting a worm garden for my chickens (and my plants) and I noticed the blog post mentions to avoid oak leaves and others with high acidity. I was wondering if you had recommendations on good leaves to use. My yard has a lot of oaks in it, but also has pecans and maples. I’ve done some research (google, admittedly) and can’t locate specific acidity of leaves for comparison. There is no great risk in using Oak leaves or any others with high acid content. The worms will simply ignore them and they don’t get composted as they should. If you use leaves and notice that the worms aren’t eating them then you can make a note not to use them in the future. You can also compost them in a conventional compost heap and then use them as bedding. Worms seem to take to them after they have been composted a bit. I have to admit that I don’t always know what type of leaves I’m using, I just try them and see how they work. I hadn’t thought that someone might think of worms as pets, but it makes perfect sence. The castings are great for houseplant and the ‘tea’ is a super food for plants. I hae a compost bin that I put red wigglers in last year. I guess I didn’t realize that red wigglers could be fed to my chickens. I’m wondering how and when they should be fed to my chickens. My chickens also love it when they see me coming with the shovel. Jodi, you can feed the worms to your chickens at any time, just be sure you keep enough to reproduce. I give them a few now and then as treats. When I separate the worms from the castings after it has built up to a point that it needs to be removed, I usually have far too many to feed them all at once. Then I dry them and feed them during the winter as a good source of protein. I just started a worm bin for my kitchen, chicken, and son this weekend! So this is all very fun and timely, thanks! And a Yikes note…don’t dispose of that liquid that accumulates in the bottom of the bin. That’s compost tea! And just as valuable as the compost. Pour it on plants too, for happy plants! It’s nice to hear that you are starting a worm bin. You are right in one respect about compost tea, it is very good on plants both as a fertilizer and for pest control. Just a word of caution, compost tea is not the same thing as the liquid that drips from your worm bin. Compost tea is made in two ways, extraction and brewing. In the extraction method water is run through worm castings to release the nutrients into the water. In the brewed method castings are put into a container with water and circulated using an aerator to introduce oxygen. In my humble opinion the brewed method is the preferred method because of the introduction of oxygen. It is typically higher in the microbes that make it beneficial to plants. The water that drips from the bottom of worms bins is anaerobic and is toxic and it should be discarded. How large the box should be, and how often to harvest the worms. The six of the box will be determined by how much waste you have available to process. I usually harvest my worms once a year. That is the size of the box is determined by how much waste you have. Worms will process approximately one pound of produce per pound of worms in a week. I compost in the lab at work and use nothing but white shredded paper from the office shredder and my worms are thriving. Do you have to put a lid on the container? Stephanie, it isn’t absolutely necessary to have a lid on it, but it does help to regulate the moisture content. I your bin gets too dry without the lid you may want to add one. How do you dry the worms? Lisa, I have a wood frame made of 1 x 2s with a screen bottom about 2 feet square. I put the worms on the screen and leave it in the sun for them to dry. It should be done on a very clear, hot day so that they dry quickly. Place the screen on blocks to let air circulate under the frame. Can red wiggle worms get parasites? I ask because my free range chickens will not eat the red wiggle worms in our yard. I dug some out of my yard & have been raising them, I have a lot, but chickens get excited and run to them but then don’t eat them. Red worms in the wild can get parasites and it’s possible for them to be transferred to chickens but it’s not very common. Worms can pick up certain parasites from the droppings of wild birds. If you raise worms in bins it is not likely that birds will be leaving droppings in your bedding and there is little to no risk of your worms picking up parasites. As to why your chickens don’t eat the worms, I have found in my experience that some of my chickens don’t eat them and others devour them. It appears to me that the chickens who don’t eat them are not aware that they are edible. They seem to be curious but don’t try to eat them. Although I don’t think it has to do with the possibility that the worms have parasites. I only have pineneedles in my yard can I use that instead of leaves and what can you feed and don’t feed the worms? I can’t fined the next article! Aalso it is not clear to me what the purpose of the shredded paper and the leaves or pine needles is for? Just curious… We live in AZ and it’s too hot for worms. We do have a spare refrigerator we could use. Do you know what temp the worms would have to be in? My chickens love worms and I’d love to raise my own instead of buying them as a once in a while treat! I put hay in my chickens nesting boxes and have to clean them out most every day. Can I have this poop mess be in my compost bins for registering wigglers? I’ve had wigglers in town before but they got kitchen scraps. If I can compost the dirty hay in bins that would be cool! We buried a pair of claw footed cast iron bath tubs in the ground to the lip. We blocked off the drain hole, then filled it with sawdust, peat moss and dirt. We ordered a few thousand red worms from a county monthly newsletter. We fed them bone meal for a year with weekly splashes from the hose. After a year we had so many worms, we bought bait boxes and sold them to people as bait. We squeezed out a handful of peat moss into each box and dumped a snuff can filled with worms inside. People stopped by each weekend during the fishing seasons for years. We actually made enough money to buy our first huge console color TV. People still stopped by for years after we went out of business asking if we had any worms. Can I use ashes from my fireplace to make a worm bed with other things like food and from my chicken floor of my coop ?